With Valentine's Day just around the corner, love is all around and there's a certain feeling of magic in the air. Will you be sharing the day with your special someone? Or perhaps your Meezer is your 'special someone'? 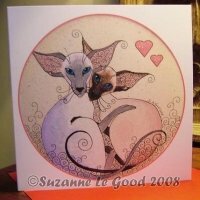 Whoever holds the key to your heart, our specially chosen Siamese cat cards and gifts for Valentine's Day will be bound to amuse and cheer you with a range of romantic, pretty things to choose from. 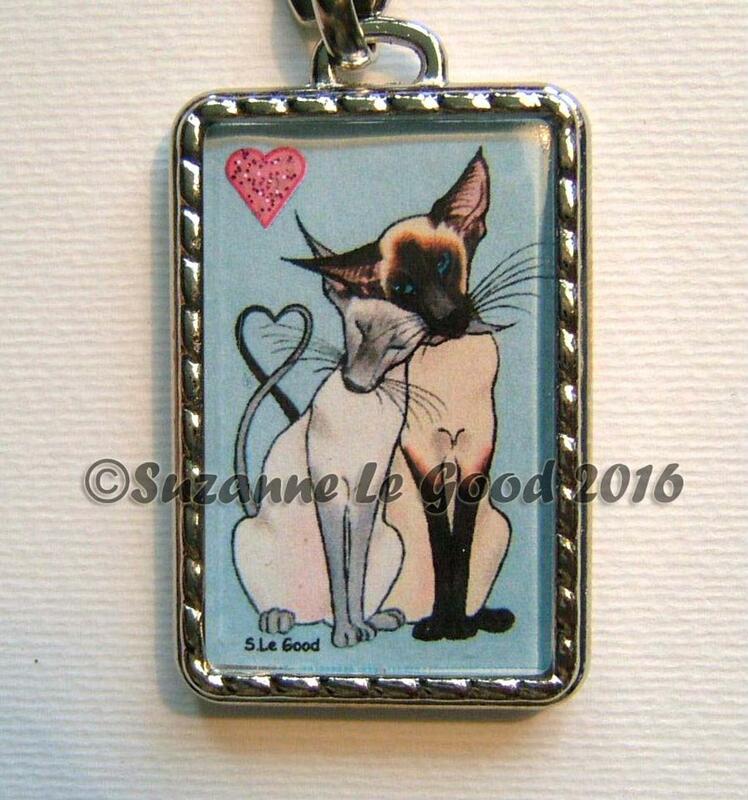 Paired up or single, why not give yourself or your partner a Siamese-themed Valentine's Day gift? 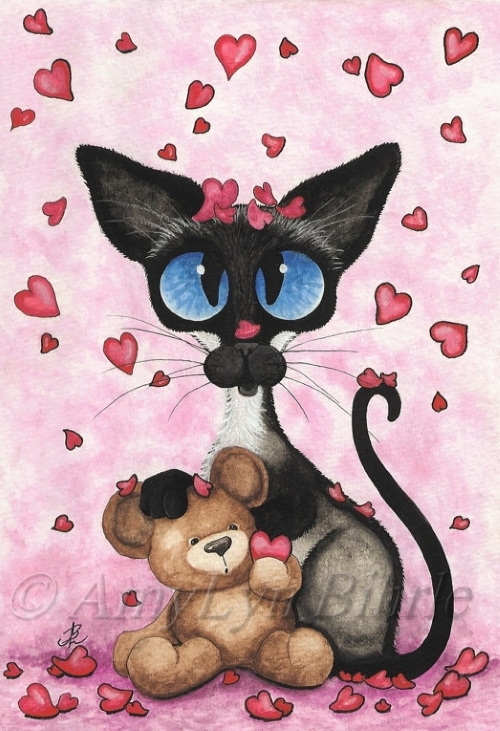 The gorgeous image above is by one of my favorite Siamese cat artists, AmyLyn Bihrle, with prints available from AmyLyn's shop on Etsy, along with a massive range of other Siamese cat art, all of which make fabulous gifts. You'll find more below. 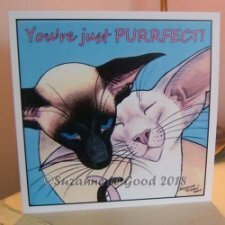 If you're looking for something small and simple, artist Suzanne Le Good has several lovely Valentine cards in her Etsy store, starting with this purr-fectly beautiful one! It measures 6" square, with a 'Be My Valentine' message inside. You can find it here in Suzanne's Gallery on Etsy, or by clicking the card opposite. 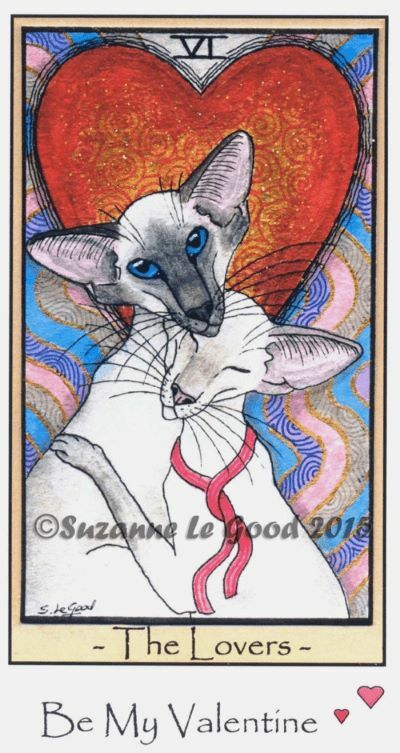 Or how about this Tarot-inspired Valentine card of The Lovers featuring a cuddling pair of Siamese cats - a blue point and a lilac point? The card, which measures 8 1/4" x 4 1/8" (approx), is handmade and made to order. The heart is decorated with gold glitter and the inside of the card is blank. Find it here in Suzanne's Gallery on Etsy. The final card in our trio is this cuddlesome pair, complete with glittery hearts and a "You're just purrfect" message inside. The card measures 6" square and comes with a red envelope. Find it here or click the card opposite for more details. Valentine's Day gifts are often centered around flowers and chocolates but if you'd like to give your lover something a little more permanent but still with a heart-shaped theme, how about one of the cuties below? 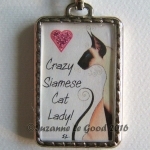 They're small, inexpensive, and very appealing and would make a great gift for any Siamese cat lover without breaking the bank. 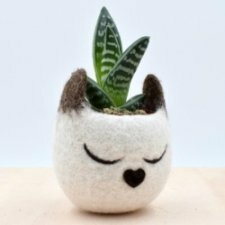 Very, very tiny - the planter holds a 2" pot - this Siamese kitty with his heart-shaped nose is perfect for miniature cacti, succulents or air plants. (Plants not supplied). Available from The Yarn Kitchen on Etsy, it ships from Italy so it you're buying it, make sure you allow enough time for it to arrive. We return to Suzanne Le Good's work for our next choice - keyrings that can also be used as handbag or cat carrier charms. They're made of metal, heavy and solid, the 'fob' part of the keyring measures 1 3/4". Each one contains a tiny print of one of Suzanne's popular pieces of artwork, enhanced with a glittering heart especially for Valentine lovers! Click the photos to find more details in Suzanne's Gallery on Etsy. Not wholly Valentine's related, but other small, thoughtful gifts for a Meezer fan could include books, so here are two we've read and recommend. Both are available in Kindle or paperback versions on Amazon - the links or images below will take you there for more details. Return to Tythecott by Sylvia Court is a delightful story about a Siamese cat called Rufus who, through no fault of his own, loses his early, happy home and goes through a series of fortunate and not-so-fortunate adventures until he finally comes full circle to a safe, loving, forever home. Reminiscent of The Incredible Journey, it has the added bonus of beautiful cover artwork by Suzanne Le Good. Moon Diamonds by Madeleine Purslow is about actress Monica, whose memory starts to fail her at crucial times - a disaster for any professional. Deciding to retire rather than struggle on, Monica wonders how she'll ever fill her time but her love of Siamese cats comes to the rescue. With some wonderful characters (Monica's dealings with the breeder from whom she gets her second cat are a joy) it's gentle, funny, poignant and sweet. A perfect book for Siamese cat-lovers!